Centurywise CW7 traffic film remover is a highly effective general purpose hard surface cleaner. CW7 is safe use on virtually any surface that is safe with water, without affecting the environment with harmful glycol fumes. Product will quickly remove dirt and grease from vehicle bodywork, machinery, engines, plant, interior walls, floors, worktops, painted surfaces, light fittings, tiles,marble, oven tops etc. TFR removes grease, grime, nicotine, carbon, ink, dirt, dyes, creosote, and most stubborn deposits quickly and easily. 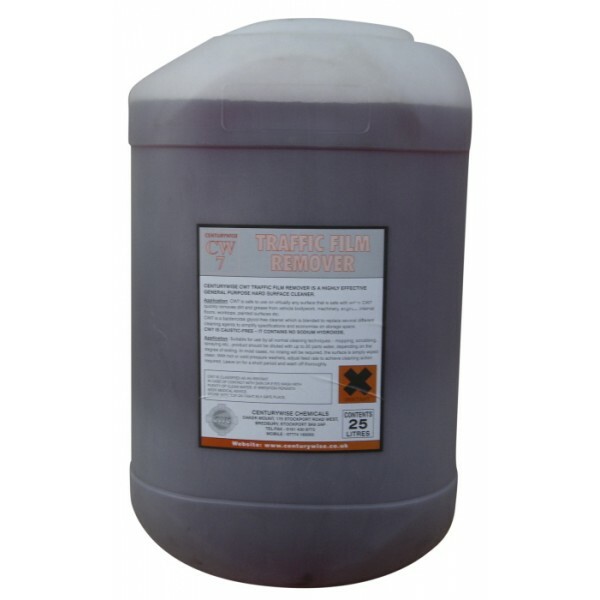 TFR is a bactericidal glycol free cleaner which is blended to replace several different cleaning agents to simplify specifications and economize on storage space. APPLICATION Suitable for use by all normal cleaning techniques - mopping, scrubbing, spraying etc. Product should be diluted with up to 20 parts water, depending on the degree of soiling. In most cases no rinsing will be necessary, the surface is simply wiped clean. With hot or cold pressure washers, adjust feed rate to achieve cleaning action required. Leave on for a short period and wash off thoroughly.